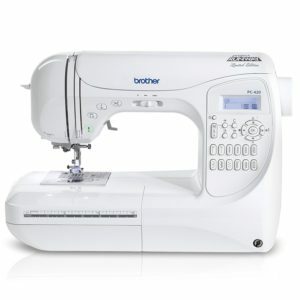 The feature-rich Brother Project Runway PC420PRW sewing machine has been constructed by Brother International Corporation. This is a limited edition machine with a comprehensive set of features and accessories that can be seen only in the high end machines. The company which has earned its reputation as the leading manufacturer of innovative home products is now offering the product with ease of use and flexibility at affordable price range. This sewing machine is a high quality and state-of-art machine which would help you in producing professional-level results out of it. This machine has been incorporated with as many as 294 stitches and this number is far more than that are present in other Project Runway machines like Brother Project Runway CE7070PRW. The current model of sewing machine comes in-built with eleven presser feet along with the hard case and a complete set of accessories. This 120 Volt AC machine has a metal frame construction which would offer the machine with much needed durability. This computerized sewing machine will reach your hands with a lengthy warranty period of 25 years from the manufacturer. In addition, the complete set of the package will also contain a bilingual instruction manual to make it easier to learn about the machine and use it. Built-in Stitches: The sewing machine in review has almost 294 in-built stitch functions along with ten styles of one-step auto-size buttonholes and three lettering styles. These stitches include 67 utility stitches, 31 decorative stitches, 5 cross stitches, 16 satin stitches and 10 decorative sating stitches. Six-point Feed: With the 6-point feed dogs, you can find it easier to feed your fabrics. This feature would allow you to sew a wide range of fabrics and helps in achieving the more precisely formed stitches as per the sewing machine reviews. Easy-to-read Display: The back-lit LCD display screen in this machine is easy-to-read and multi-lingual. This screen would allow you to view the settings along with stitch length, width and type of presser foot to use. Independent Lighting: The independent LED lighting in the needle area would brighten the details of your project and will be easier on your eyes. This feature is helpful especially when sewing the darker fabrics. Threading is Automatic: You can avail the easier and automated threading in this machine. You will have to simply follow the diagram imprinted on the machine and your machine will be threaded automatically. Speed and Speed Control: The current sewing machine would offer you with the speed of 850 stitches per minute and the convenient speed slide would help you in controlling this speed. This machine has been constructed with some of the extraordinary features and these make this machine as an excellent sewing machine in the current market. My Custom Stitch: With this exclusive feature, you can be able to design your own stitches and save them to the machine’s memory which can be used in the future. Automatic Trimmer: This machine has been in-built with automatic thread trimmer which would cut the upper and lower threads upon completion of each task. System of Bobbin Winding: The current sewing machine is featured with the super easy system for bobbin winding with which the bobbin will be quickly wound for you. Twin Needle: The twin needle function will be useful when you want parallel stitches sewn close with each other. This will be ideal to be used for hemming, quilting and much more. Knee Lifter: With the knee lifter feature of this machine, you can be able to raise and lower the presser foot more easily and hence, yours will be free to reposition or remove the fabrics. Presser Feet (Walking foot, over-casting foot, monogramming foot, zipper foot, adjustable zipper, blind stitch foot, buttonhole foot, quilting foot, stitch guide foot, non-stick foot, open-toe foot); Three bobbins; Seam ripper; Needle set; Twin needle; Cleaning brush; Eyelet punch; Screwdrivers; Spool caps; Extra spool pin; Spool net; Grid sheet set; Foot controller pedal; Protective case. It is easy to achieve professional results with this computerized sewing machine by using the exception feeding system, presser foot pressure adjustment, easy bobbin system and the one-handed threading system. Moreover, the feature of ‘my custom stitch feature’ will allow you to save your stitch settings and you can use this stitch function the next time without having to re-do everything. You can easily control the speed with illuminated start/stop feature and can sew without the foot controller. In addition, 11 included presser feet would help you in producing designer level finishing more easily. This machine will be easy to use for both the beginners and experts as most of the features are automatic. Lots of customization is possible with this machine which would allow you to sew anything to your desires. The current sewing machine is available in affordable price range. And you can grab the chance of purchasing this machine at an offer of 43% discount when you opt to buy this product from www.amazon.com. The default position for the needle is to the left and so, it may be difficult for people who got used to other machines. Letter stitches are found to be smaller. 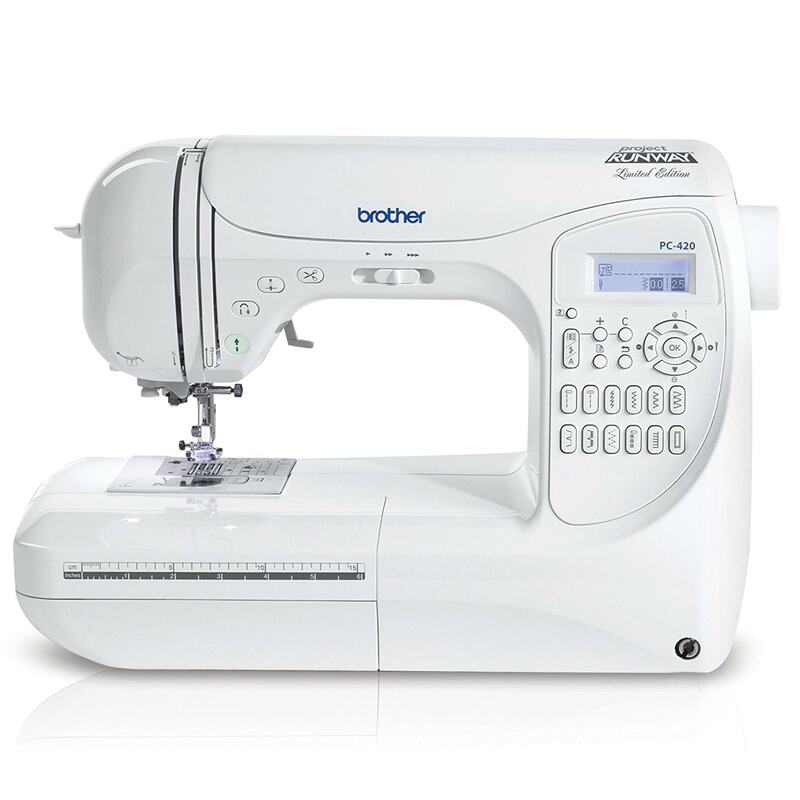 The Brother Project Runway PC420PRW sewing machine will be ideal choice for beginners as well as experts. This is a great machine in all standards and the pros with this machine can be found out-weighing the cons. Thus, this will be a good machine for those who want high value for their money.